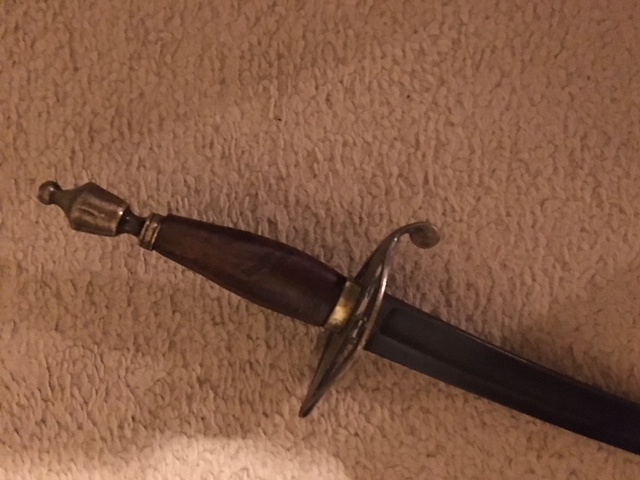 Forum Index > Historical Arms Talk > Show Us Your 19th Century Swords! Swords for all occasions, I like them. That's a really nice piece of ivory there. The last sword in here is an oddball little horn gripped spadroon. To complete the occasions, a night at the opera. 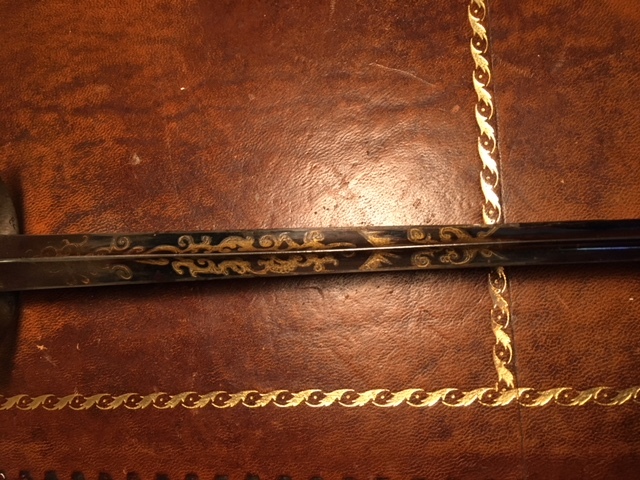 The ivory hilt on the spadroon is very nice, a lot of the reason I bought it. 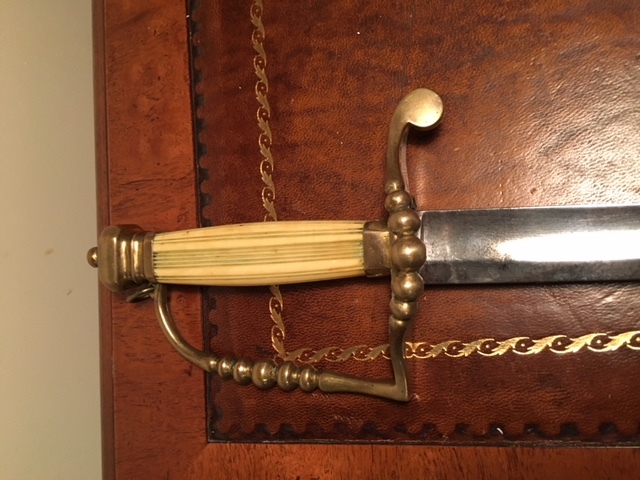 Simple but really nicely executed, Blade is in good condition too, but overly cleaned so the etched decoration is faded. 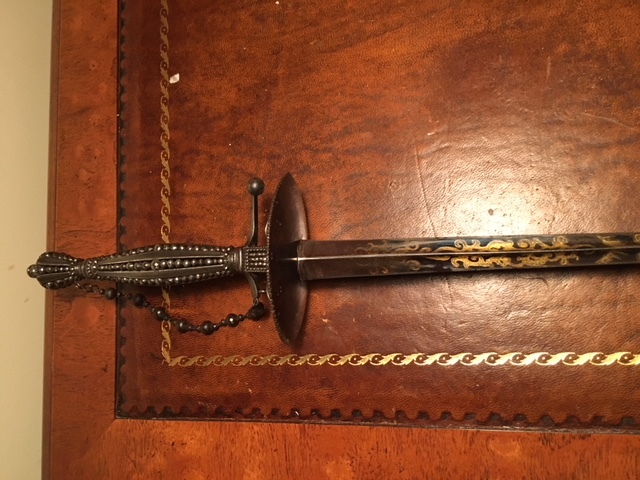 I thought I would add this one as although it isn't much it is a very special sword to me. 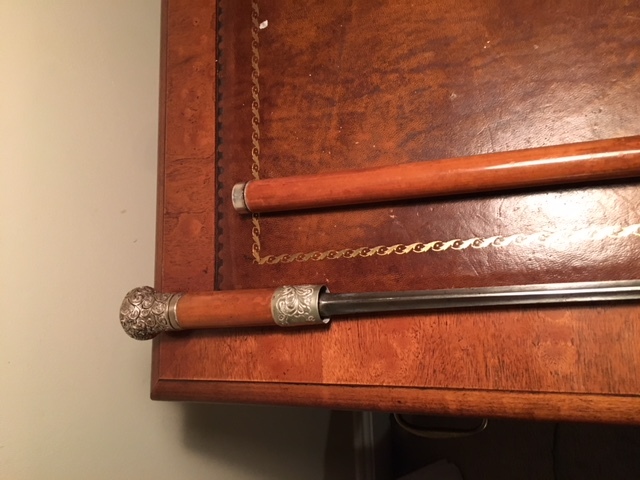 It is the first antique sword I ever bought when I was 13 years old with money from mowing lawns and chores. I was interested in antiques arms and armour from when I was a kid and read any book I could get my hands on on the subject. There were only a few antique shops around and no arms and armour so when this sword appeared in a window I was overjoyed. It isn't much as you can see. 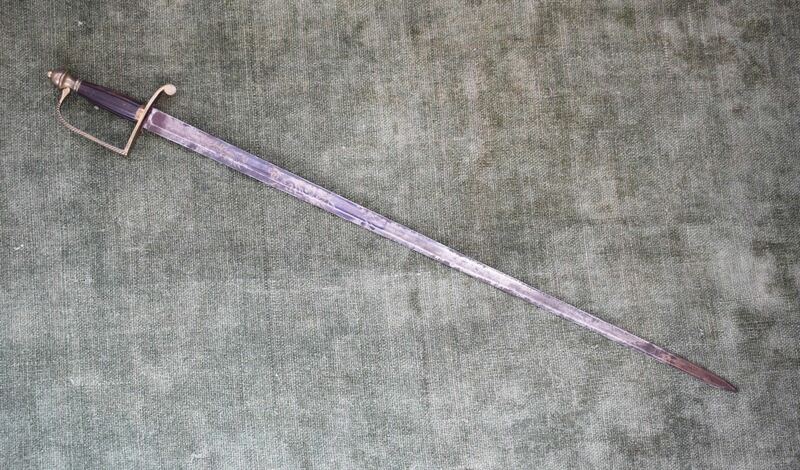 A spadroon hilted sabre with the knucklebow missing and heavily patinated. 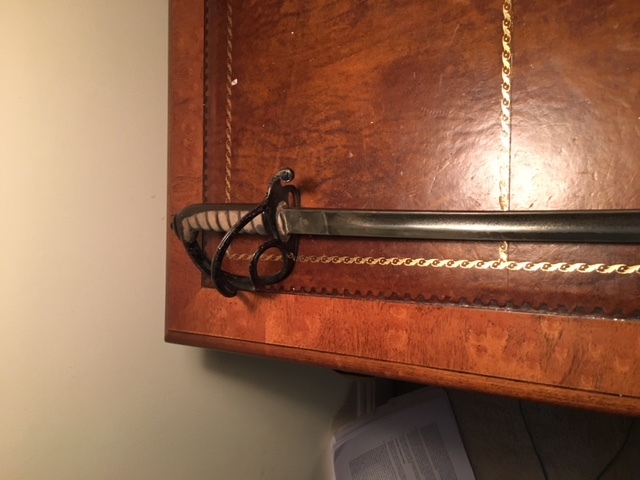 Maybe a late 18th century/early 19th century colonial militia sword maybe ? To this day I don't know. It was in the window for £11 (this was 30 odd years ago) but I only had £8 from mowing. I remember going down to the shop armed with my research and recent auction catalogues I had got hold of and subjecting the poor guy to the most boring speech imaginable about why he should sell it to me for £8. The antiques guy listened very patiently while drinking his tea and at the end he smiled and said, ' It's a while since I've heard that kind of enthusiasm' and shook on it for £8. Didn't matter what kind of sword it was, I was a collector now ! I took a long break from this hobby in my 20's and 30's but when I started again I found it under my old bed at my parents' house wrapped in a sheet. It now sits next to much more aristocratic rapiers and smallswords and bronze age weapons but it's earned its place !. The "2" is probably "Second". "ST" must be the name of the regiment. "L.I" could be "Light Infantry" och perhaps "Line Infantry". The "2" below the first line I suppose marks the Sword as number 2 in the regiment. 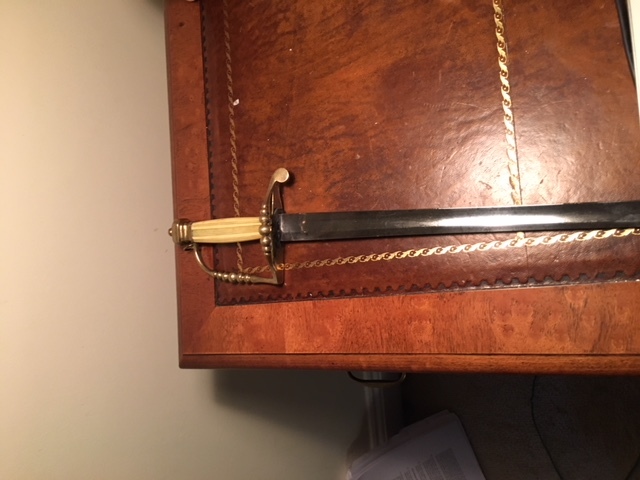 My guess is that the "ST" stands for Staffordshire and the the Sword could have belonged to a Sergeant in the 80th Regiment of Foot (Staffordshire Volunteers) that formed the 2nd Battalion in the South Staffordshire Regiment from 1881 or the 2nd Volunteer Battalion: 3rd Staffordshire Rifle Volunteer Corps in the same regiment. 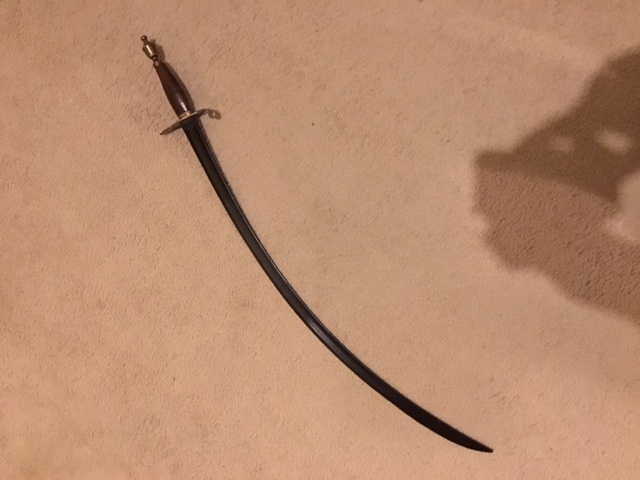 Can anyone correct me if I'm wrong or give me some more information about this fine looking fighting Sword?